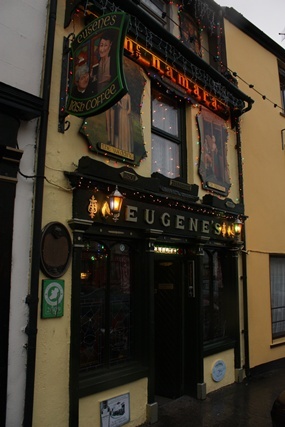 Here we found Eugene’s, a pub with windows of leaded glass painted like those of a church. Damien explained to me that a sign outside of “Father Ted”, was of the main character of a T.V. show that was very popular in Ireland and even more so in the West. This was the second pub we had seen on our short westerly trip that had a reference to this show (the other one being Kennys in Lahinch). 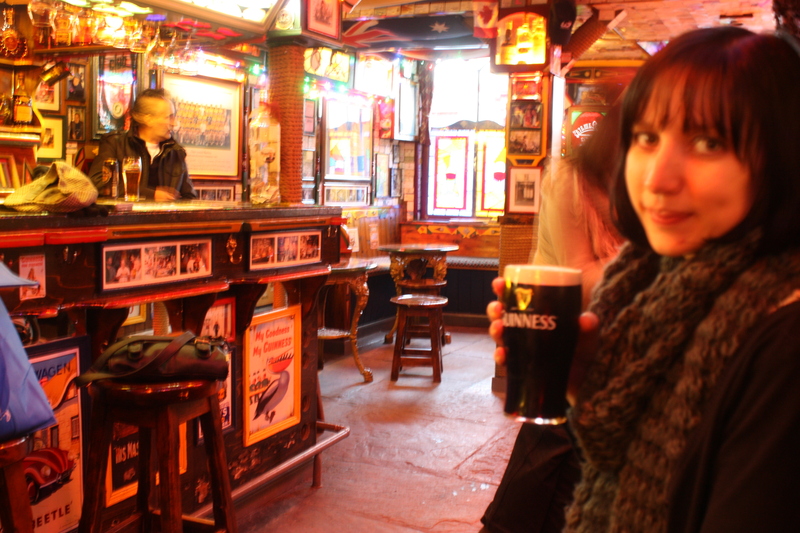 The rain encouraged us to go inside this cosy looking pub for an evening drink. It was a long, multi-coloured place with dark stone floors and private seating booths running along one wall down by the back. It had a sense of being once quaint, but now quirky. Our eyes moved directly to the open fire on the left-hand side, which was covered in fresh coal. The interior was mainly pictures; with tasteful photos and Lisdoonvarna Festival posters, plus assorted signs like “The price in the bar is depending on the attitude of the customer” and (somewhat strangely) business cards of passing guests from all over the world. Certainly the cards were not of locals anyway because there were easily more cards than there were people in the village! Given that it is still the early evening, there were only a few people inside (or a ‘scattering of regulars’ as Damien called them). Their conversation stopped when we walked inside and their eyes were drawn our way. This, as always, starts a conversation. “We don’t get many Swedes in here” comes the inevitable reply. One of the most frequent questions I get asked is “How can you be Swedish, you’re not blonde?” I was not to be dissappointed this time either. To be honest the ‘Swedish thing’ got me a seat near the fire, so I couldn’t complain, finding myself seated right next to the guy we will now refer to as ‘The Chicken Guy’ (more on that shortly!). 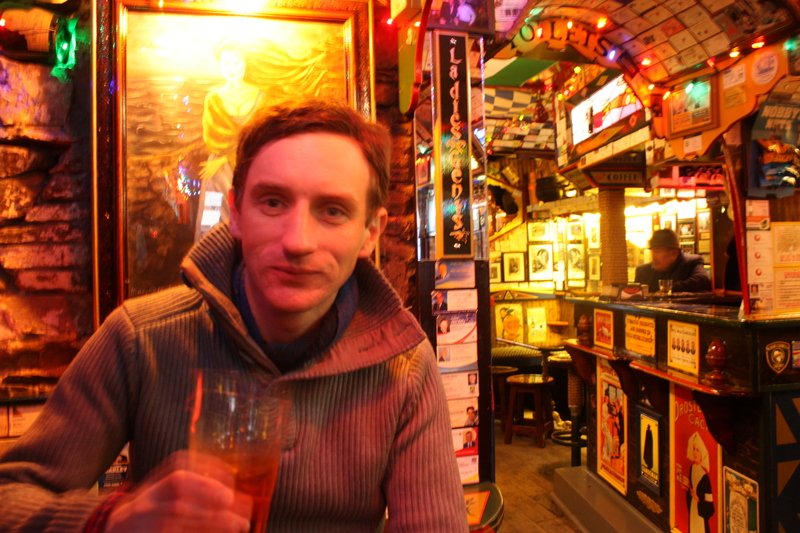 Eugene’s was definitely a colourful pub, in more ways than one! Note ‘The Chicken Guy’ holding up the bar on the far left. The people in the pub all seem to know each other but there are in particular two people showing a concerted interest in us; one a woman who had relatives in Louth and now wants to discuss that with Damien; the other being our new friend ‘The Chicken Guy’. During our time in the pub there is constant conversation about chickens, mostly from you can guess who…. We learn that “chickens are the ancestors of dinosaurs.” His female companion from County Louth is on the verge of going insane with the ‘chicken chat’; “why do you always need to talk about chickens?” To this challenge, ‘The Chicken Guy’ turns to me and asks “Do you have chickens in Sweden?” I was wondering what he meant; of course we have chickens in Sweden!! So I ask if he meant as pets, because in that case, then no, not so much. He wonders why you wouldn’t keep them as pets. Try to get into, or more importantly out of, that conversation. I dare you! The interior brimmed with colour & character and even in the early evening, exuded a warm atmosphere. That may have been the fire though! Visit because: The quirky interior, not to mention the quirky conversation, against a charming backdrop of grey slate floors and a roaring open fire, make Eugene’s the must-stop spot on Ennistymon’s main thoroughfare. There’s a fine selection of whiskeys, cognacs, gins and vodkas available too.